The Diabetes Food Pyramid is a tool to help visualize the number of servings from each food grouping you would aim for in a healthy diet. The top of the pyramid represents fewer servings, while the bottom of the pyramid -- the widest part -- represents a larger number of servings. 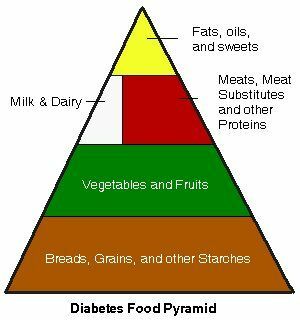 The Diabetes Food Pyramid groups foods according to their carbohydrate and protein content instead of the better-known "food groups." For example, cheese is a protein rather than a dairy product (as in the regular Food Guide Pyramid). Serving portions are also different because they are based on carbohydrates per serving. Breads, Grains and Other Starches: 6 to 11 servings per day. Included in this group: bread, oats, rye, cereals, rice, pasta, plus starchy vegetables like corn, peas, and potatoes. Vegetables (3 to 5 servings) and Fruits (2 to 4 servings). Included in this group: most vegetables and fruits. The exceptions are starchy items like potatoes and corn, which belong in the Starches group. 1/2 cup of canned fruit. Milk and Diary Products (2 to 3 servings, with an emphasis on low-fat products). Included in this group: milk, yogurt. Cheese is not a part of this group, but rather included in the Meat group due to its protein content. Included in this group: beef, pork, chicken, turkey, fish, eggs, tofu, cheese, cottage cheese, peanut butter, and dried beans. 1/4 cup of cottage cheese. Fats, sweets, and alcohol (consume sparingly). Included in this group: treats like potato chips, cookies, candy, cakes, etc. Also includes alcohol and oil (including that which you use in cooking). 1/2 cup of ice cream. Watch a registered dietician explain the diabetic food pyramid - she gives some great easy tips on how to measure your portions. Obviously people are not robots, and sometimes we naturally want to have our favorite foods. Try to substitute whenever you can -- for example, if your meal just wouldn't be complete without that corn on the cob, then have it -- but give up the dinner roll or potato that you'd normally have with your meal. Because corn is classed as a "starch", the item you "swap out" for your corn should also be a starch. It's all about balance. You can still eat a varied diet with lots of tasty foods... it's just a matter of learning how to balance the carbohydrates in your meals, whether those carbs come from breads, pastas, starchy vegetables, or other sources. The Diabetes Food Pyramid is only a guideline. As a part of your diabetes treatment plan, consult with a dietitian to develop an individualized eating plan with appropriate portion sizes.